It might be nov. but to my daughter her pumpkins are just as good as the first day they were picked, and to be honest they are. So being a toddler she wanted to play with them. That is how this came up. 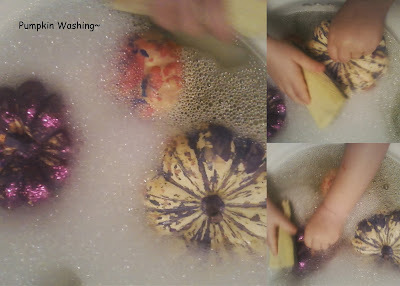 Throw some pumpkins in a bin or sink add some soap, water, cup, and a dish scrubber(or what ever you would like to use) and let ur little one/ones have fun washing pumpkins. note- these were pumpkins were painted before, so she loved trying to get all the paint off.